Hidden Springs Senior Living is a country-style community located a few miles south of the northern entrance to the Skyline Drive. The community is situated on twenty acres of farmland atop a hill with panoramic views of the Blue Ridge and Massanutten mountains. An outdoor enthusiast can take a leisure walk over the landscaped grounds, relax with a friend on the porches, or dine on one of the patios. Gardeners can claim raised flower/vegetable beds. One and all can view a sunrise or sunset from the enclosed sun rooms. Residents can join together in the living room, library, or the recreation areas to chat with family, friends and neighbors. Residents can look forward to individual and group workouts in the Physical Therapy room, or spend an afternoon streaming religious programs or films in the Chapel/Theater. At Hidden Springs Senior Living residents will live and prosper through safe and natural surroundings, superior quality care, activities, companionship, and love without the stress of home management. With 24/7 staffing and graduated levels of care from independent living until end of life, Hidden Springs Senior Living can meet all of your needs. H.S.S.L. is owned and operated by Daryl and Vicki Rudacille Davison along with their son Aron. Both Daryl and Vicki grew up on farms with strong Christian values and are lifelong residents of historic Limeton, Virginia. Daryl, a graduate of the University of Maryland, has more than thirty years of management experience. He has worked in the healthcare industry for the majority of his career. Vicki, a graduate of Mary Washington College taught biology in the local school system. She has a very outgoing personality and enjoys the company of senior adults. Vicki has a special fondness for Hidden Springs Senior Living because it is located on her family farm. Aron, their son, helps everywhere he can. Aron enjoys a one-on-one relationship with many of the residents. Aron is very loving and continues to be an integral part of the community. Daryl, Vicki, and Aron are members of the Page United Methodist Church in the Luray, Virginia area and attend church regularly. 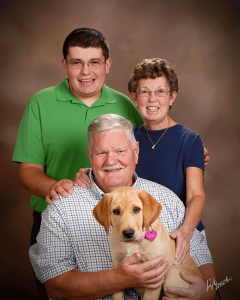 Some of their hobbies include farming, gardening, reading and, taking family walks with their lab, Mazie. H.S.S.L. is unique and different from most assisted and independent living retirement communities. At Hidden Springs Senior Living, you are treated like family. Daryl, Vicki, or Aron say grace before meals and dine with the residents in the gracious dining room. Their office doors are always open so as to encourage residents and families to stop in. If there is a concern, they will always work together for a resolution; your opinion matters to them. Monthly residents and families receive progress reports. The progress reports are created by the directors of nursing, activities, and dining. These reports are in an effort to keep you informed. H.S.S.L. is filled with love, laughter, and owners along with staff that have compassion for the residents who live here. A happy environment makes for a content staff and better health for the residents.